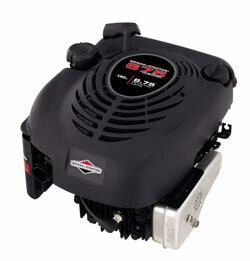 Briggs and Stratton 3.5-7.5 Vert. The 3.5-7.5hp replacement Briggs and Stratton vertical engines listed are mostly used for replacing a push mower Briggs Engine or walk behind lawn mower with a Briggs and Stratton Motor, they are also priced very competitively with only $7.95 shipping. There may be a few that are intended to be used on various other equipment like wood splitters, pressure washers, etc. Please match either the Model-Type # needed or the crankshaft and/or alternator if equipped. We also carry aftermarket and genuine original equipment Briggs and Stratton Engine Parts if needed. The Briggs & Stratton Engines Listed below are all brand new and come with a full manufacturers warranty. These Engines are all Current Production Engines - No overruns - also known as manufacturers leftovers, or out of production engines. Features: Aluminum bore. One-StartTM float carburetor. Compliance. Maxi-CleanTM automotive-type pleated paper air filter. Mechanical torque control for additional power. 1.6qt fuel tank. Super Lo-Tone muffler for quieter operation. Crankshaft: 7/8" Diameter x 3 5/32" Length Crankshaft, Tapped 3/8" - 24, 2 Woodruff Key(s) and 3/16" Keyway.